Cordless pin nailers are still working their way into the industry. Ryobi's comes in with solid performance and a reasonable price point. Ryobi cordless pin nailer – it’s probably the easiest to make from a power standpoint, yet a class that isn’t widespread in the cordless sector. But for woodworkers and carpenters securing more delicate pieces, it’s a must-have tool. The Ryobi P318 enters the race as part of the AirStrike system of cordless nailers. It moves in to finish off a pretty comprehensive group that also includes 15-gauge, 16-gauge, and 18-gauge cordless nailers and staplers. You expect pin nailers to be lightweight since they’re among the smallest you use. The Ryobi cordless pin nailer is definitely the smallest in the Airstrike line. But at more than 5 pounds with a battery (4.0 AH), you’ll still notice a pretty significant weight increase over your pneumatic models. Because you don’t have a nose to depress as a safety feature, there’s a double action trigger you need to work. Use your middle finger to slide the safety down and pull the trigger. Just be careful – the design gives you the ability to fire a nail when you’re not pushing against material. You’re looking at sequential fire only – not surprising on this class of nailer. Dry fire lockout will prevent the trigger from activating the driver blade when you don’t have any nails in the magazine. A mechanism in the magazine itself acts as a block. However, if you try to fire with the magazine open, that block isn’t there and the nailer the Ryobi P318 will fire. The magazine is simple to operate. A plastic button at the base releases the cover so you can slide in up to 120 pin nails. Then just push it shut. I like that, aside from the release button, the Ryobi cordless pin nailer uses a metal magazine. You get a non-marring edge guide to help keep your nails at a consistent distance away from your material edge. If you happen to get a jam, you will need the onboard hex wrench to access it. There’s no tool-free option on this model. The Ryobi P318 features a belt hook that you can connect to either side of the tool. But even if you don’t want to attach it to your waistband or tool belt, it will stand up just fine on its own with any of your Ryobi batteries. Ryobi is among the first manufacturers to produce a cordless line of finish nailers. One of the issues the industry has been pushing to solve is the firing delay after you pull the trigger. There’s still a delay with the Ryobi cordless pin nailer – roughly 1/2 a second. It’s not bad and I don’t find that it negatively affects my ability to work efficiently and accurately. When it comes to power, that really shouldn’t be an issue with a 23-gauge cordless nailer. And it isn’t. There’s not even a depth of drive adjustment to concern yourself with. Each of the nails I fired drove without an issue. With 3500 nails per charge, you’re unlikely to outwork the battery, even if you drop to a compact pack to save weight. The weight is probably the biggest talking point as you move from a pneumatic to a cordless model. But this isn’t a “work all day installing trim” kind of tool. 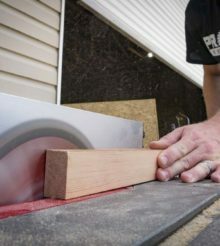 It’s a woodworker’s tool that is more sparingly used throughout the project. In that regard, I don’t think the weight makes as much of an impact as it does with other finish nailers. The Ryobi cordless pin nailer is an effective tool for more delicate work that needs to be held in place while glue dries. While it’s heavier than pneumatic models, it’s not a tool you’ll be working overhead with all day, so I don’t find it to be a detriment. The important thing is that it delivers pin nails with the consistency that you need – even though you still have a slight firing delay when you pull the trigger. $129 put the Ryobi P318 in the range of many name brand pneumatic pin nailers, but more expensive than the bargain brands. If you’re already on Ryobi’s One+ 18V battery platform, it’s a good addition for woodworkers and carpenters. If you’re not, keep in mind that one battery pack opens up a comprehensive line of cordless finish nailers. How does this perform in hardwood? I like, nay, love the idea of this. My only problem is that Ryobi pricing structure is so wonky. I have no interest in any of the tools that they sell in kits, yet they want, relative to their kit prices. an arm and a leg for a decent battery and charger. I have been an avid user of their 18g. for as long as this tool has been on the market, let me preface this by saying that I was very sceptical of this line. My attempts to destroy this 18g tool did not work. I have to say that I look forward to the 23g. version as the 18g. freed me from the need of the micro compressor and hoses. The simple feeling of showing up and getting straight to it is time savings enough over the short and long term! Still no mention of the country of origin. Though I know that Ryobi is completely made by slaves in china. And why are people still using nails? Nails are terrible ancient technology. The only reason I would use nails is if I only wanted to hold something together momentarily, because that’s all nails do.